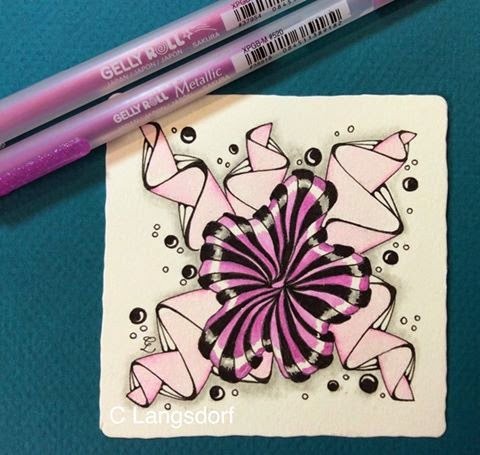 Alphabee Tangles: Weekly Challenge #190: "Pink for Ardath*"
Weekly Challenge #190: "Pink for Ardath*"
Technique - new to me - used my Gelly Roll pens and then pulled the color with a water brush. Just like painting with glitter. Such a great technique with these fun pens. This is a beautiful tile and a technique I have not head of before. Oh my gosh! That looks like a piece of candy! Great shading. This is lovely, I like the scrolls as well as Aquafleur. Nice technique with the shine. I really like this one, your colors are amazing! And that aquafleur really pops of the tile! Wow, such a beautiful tile and the effect of the pens is great. Great tile and I love your tangle selections! I love this! It is beautiful!